We started on our maiden road trip to Dandeli in ominous weather conditions. A storm had hit the eastern coast of the Indian peninsula the previous day. And it was forecasted to head inland in a northern direction and weaken over the state of Andhra Pradesh. So while the current conditions were not favorable, Dandeli was in the Western ghats and we were hoping for some good weather. However, as we crossed Chitradurga, it started to rain intermittently. Unfortunately, the downpour got heavier and heavier as we approached the Western Ghats and we finally made it to Dandeli in about nine hours. Unfortunately for us, the storm had changed course and it now headed in a North western direction making the next couple of days in the Western ghats a complete washout. 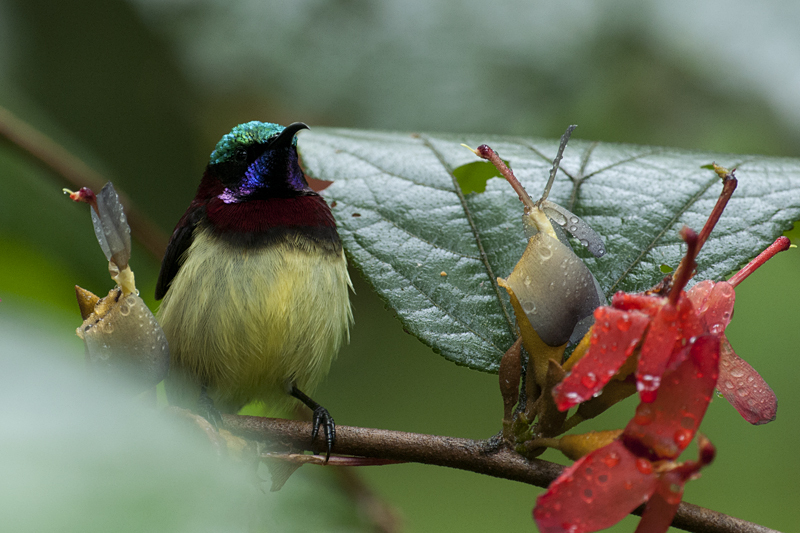 This sighting of the Crimson-backed Sunbird turned out to be the highlight of our trip. The dinner hall of the Magazine House, Jungle Lodges property in Ganeshgudi, was surrounded by flowering plants on one side. 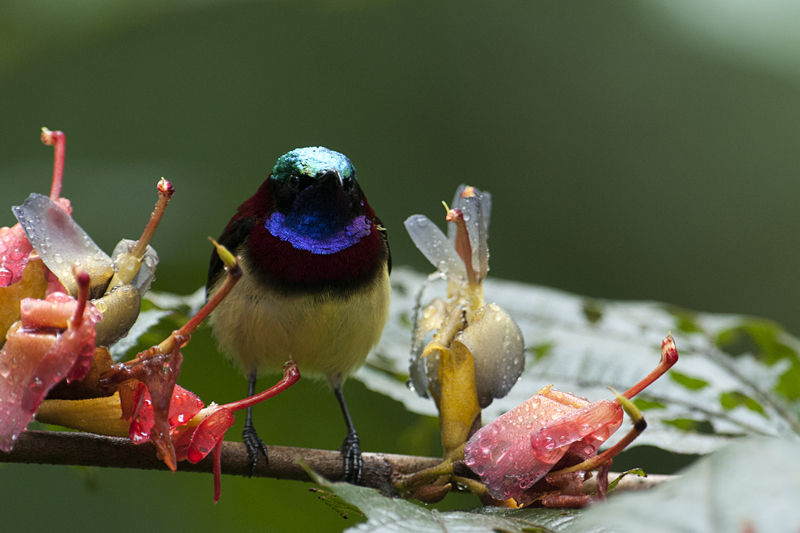 Every time the rains stopped, the Crimson-backed Sunbird, supposedly a common resident in these parts could be seen flitting around the flowers. This gave us the opportunity to try our photography skills in the challenging lighting conditions. 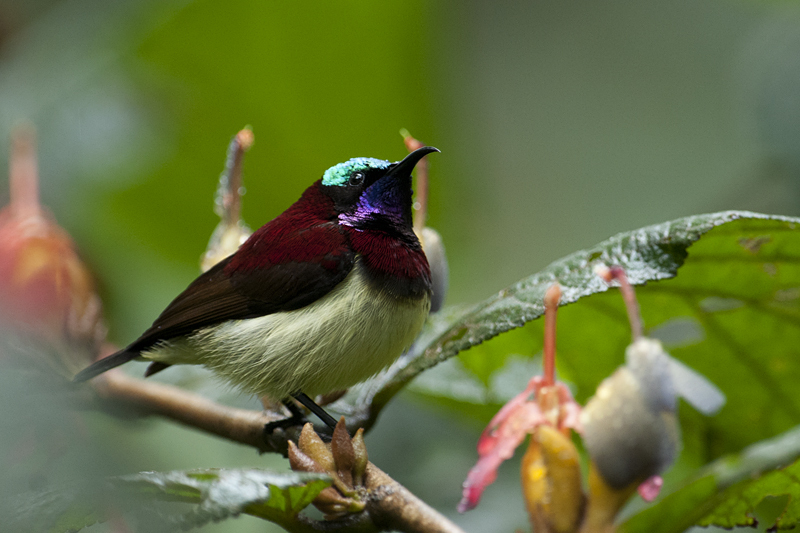 This Crimson-backed Sunbird should have felt like a celebrity since at any point in time there were about five photographers trailing their cameras on it! He also seemed to understand our plight and willingly obliged with some cool poses. Every now and then he would look straight at us and wonder when will we get fed up with taking his portraits. 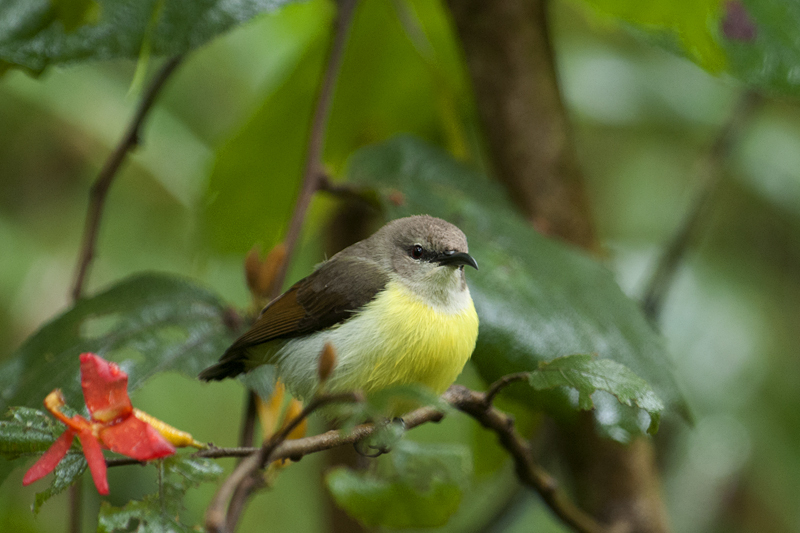 Little did he know that he was our only subject within focusing distance and none of us wanted to venture out of the lodge since the rain god was playing truant. 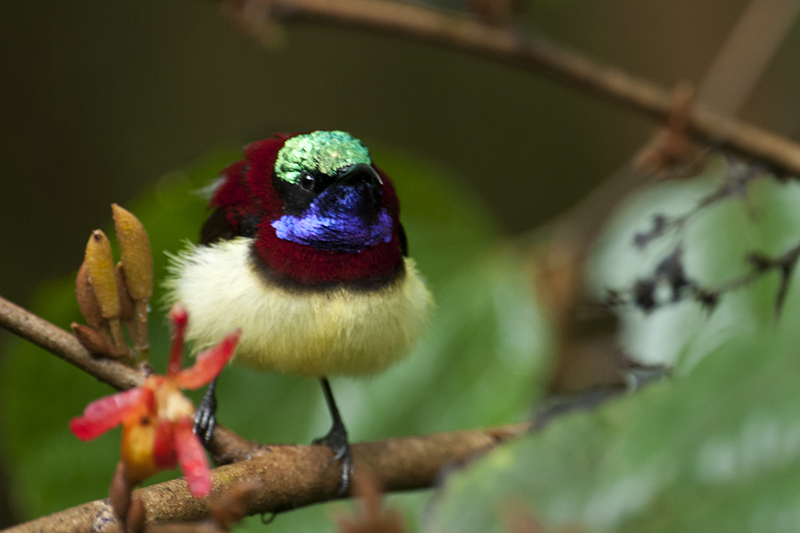 While the somewhat angry expression on this female Crimson-backed Sunbird maybe because of the fact that all the photographers were busy focusing on her colorful mate. Lovely shots of this beautiful bird, Thomas. I think you did very well under these unfavourable conditions. What a wonderful set of pictures of this splendid bird Thomas. The result is sumptuous!